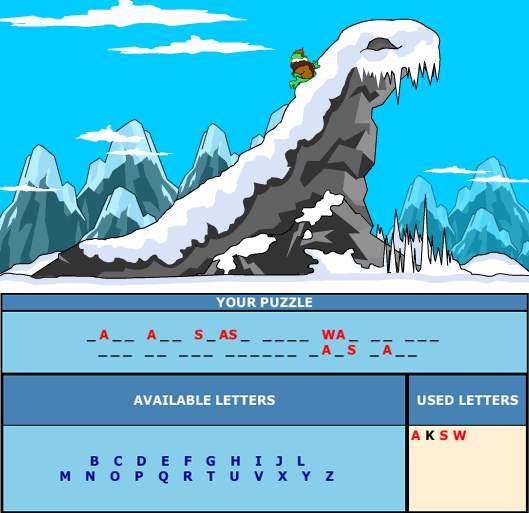 Cliffhanger is the Neopets version of the classic game 'Hangman'. Except in this verison, no one gets hung. Instead, the unnamed Cliffhanger Tuskaninny falls off a treacherous Terror Mountain peak if you lose. No pressure, right? To begin, choose which skill level you would like - you can pick from easy, average and hard. The difference in the levels is the number of letters you are allowed to chose from to solve your puzzle, as well as your Neopoint reward if you win. Next, click on an available letter to make your guess - if it is in the puzzle, it will appear on the dotted lines that make up the words of the phrase. If it is wrong, then the Tuskaninny will move up the cliff towards the top. If you're curious about your guesses, you can look at the 'used letters' box; red letters denote correct guesses and black letters denote incorrect ones. If you have too many incorrect guesses, the Tuskaninny will reach the top of the cliff and fall over, ending the game! Once you know the phrase, copy and paste it into the answer box and submit to collect your prize. In the easy mode, you have all 26 letters of the alphabet to guess from. In average mode, you have only 22 letters, and in hard mode only 18. The game will take away your vowels and the most common consonants first, making it harder to guess the correct answer. The table below will show you exactly which letters you have in each mode. You can only make 5 incorrect guesses - if you make a 6th, it's game over! Solve the puzzle as soon as possible - this prevents you from accidentally losing! Below is a list of answers in alphabetical order. If you come across others, please let us know. Tip: Use Ctrl+F to search these solutions for a word or words that you have identified in your puzzle. Each difficulty will award neopoints when you win. If you're lucky, there's a chance winning could raise your active pet's Intelligence by 1 point! Lose a game of Cliffhanger.